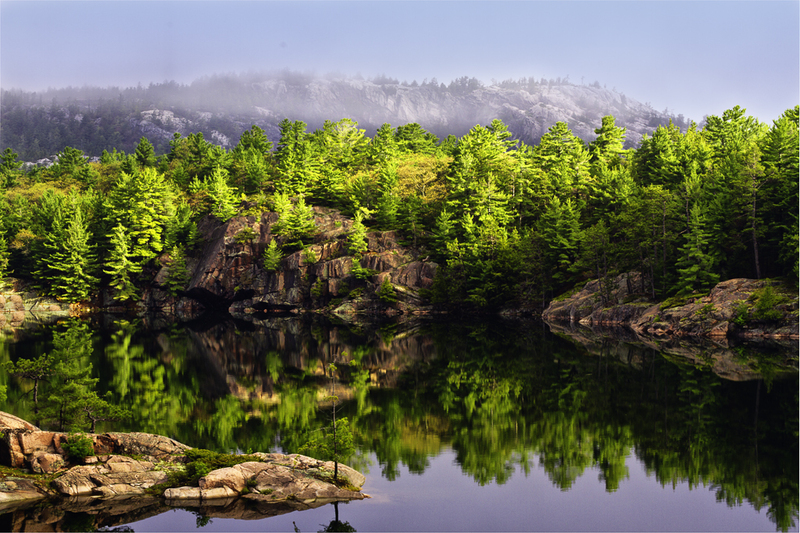 I woke up last Friday morning at 4:00 a.m. to a cloudy morning.It had rained that night.I loaded my photo gear and headed to Killarney Provincial Park.My destination was A.Y. Jackson Lake. The two previous trips had been unsuccessful.The road into Killarney was foggy at times and I had to slow down once for a deer crossing the road.I pulled into the parking lot on George Lake and before me were mirror images on the lake.I knew I had the possibility of some good shooting.I prayed that the wind would hold off.I quickly loaded my gear and hiked into Jackson Lake,being careful of slippery rocks. The highlight of the morning was being able to finally get a panoramic of Jackson Lake with the La Cloche Mountains in the background.The fog in the mountains really made this photo along with the wonderful lighting. Beautiful shots Ken. You capture nature at her best. What an absolutely stunning shot you got there. You persistence paid off big time. I really love the reflections in the water, the color of the rocks & trees, but what makes this image (to me) is the fog or mist right above the trees. Makes the white rocks in the background look like they have snow on them. Spectacular. Perfect vantage point. One of your best. I hope we can go shooting another day, hopefully the flies will be gone by then. What a stunning shot. It makes me want to jump in the car and head up to Killarney with my camera in hand. Great work.